Really cheap flights to Canada: Newfoundland for only €283! Westjet again offers really cheap flights to Newfoundland in Canada, ideal place for all wild animal and nature lovers. 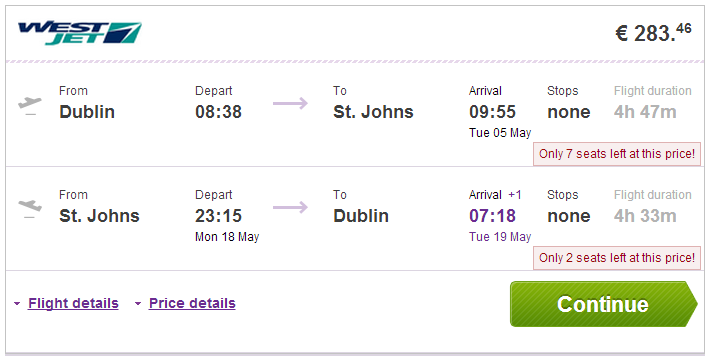 Return flights from Dublin to St. John’s (YYT) in Newfoundland are available from only €283! Travel dates are in May, June, September and October. 23 kg luggage is included and it’s also direct flight! Ryanair connects Dublin with literally whole Europe. Many other dates are available for slightly higher price around €300. Book via Vayama to get this price! St. John’s is a small city with just a few hotels but the prices aren’t that high. Use our search engine to compare all the accommodation options online at once. If you want to discover the whole area of Newfoundland renting a car is the best option to travel around so check the rates to get the best prices. « WOW! Really cheap flights to Thailand: Bangkok from Prague for €400!